The leading provider of print/online news, information and networking events for international fresh produce buyers and suppliers in Europe and the Middle East. 10 issues per year plus a range of special supplements. Fruitnet Daily News by email, Fruitnet.com news portal and many international conference events. The leading provider of print/online news, information and networking events for the UK fresh produce business. 26 issues per year plus a range of special supplements. FPJ News daily by email, the FPJ online news portal at Fruitnet.com/fpj, as well as international conferences and trade awards. The leading provider of print/online news, information and networking events for the fresh produce business in Germany, Austria and Switzerland. 47 issues per year plus 11 special supplements, Best in Fresh and the Fruchthandel Industry Guide. Fruchthandel Newsmail daily by email, Fruchthandel.de, the online news portal, and many international networking events. The leading provider of print/online news, information and networking events for international fresh produce buyers and suppliers in the Asia-Pacific region. 10 issues per year plus a range of special supplements. Fruitnet Daily News by email, Fruitnet.com news portal and many international conference events. The Chinese edition of Asiafruit, published in Mandarin, providing regular coverage of trade issues affecting the Chinese fresh fruit and vegetable market. 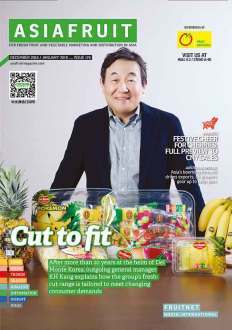 4 issues per year plus daily news updates via WeChat, Asiafruit China News and Asiafruitchina.net. International networking events and conferences. The leading provider of news, information and analysis for the fresh produce business in Australia and New Zealand. 4 issues per year. Produce Plus monthly news updates by email as well as regular updates on Fruitnet.com/ ProducePlus. International networking events and conferences.